Camping Park- Booking Enquiries: Phone 087 3278573. Ballinacourty House Caravan and Camping Park is a tranquil, unique, 4* family run park in the beautiful Glen of Aherlow. Our well-kept park provides a nicely equipped and relaxing environment for a short break or family holiday. We accept tents, caravans and motorhomes (up to 8m in length). Our camping park is strictly touring- no mobile homes in the park. Commercial vehicles not permitted. Lovingly restored in recent years by proprietor Chris, situated at the top of the camping park, you will find a gate, that leads into a most tranquil and special space. Within the imposing stone walls, a floral oasis awaits. Start by walking through the Orchard, still in it's early years- past the iron remains of the original 18th Century greenhouse, where produce for 'the big house' was grown and tended. Follow on into the main area of the walled Garden, pathways around the perimeter, to admire and appreciate the striking borders and climbers, stunning roses and lupins, and outstanding Hollyhocks and other statement plantings. Through the lawn pathway to a circular seating area with a feature bed of roses. Sit and relax. Like all Gardens, at its peak beauty in the summer months. 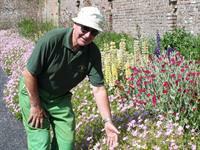 This garden is a real labour of love, and as work continues, it blossoms more every year. Chris would be happy to show you around by arrangement outside high season. 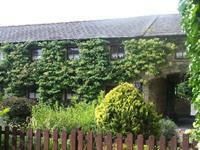 Our self-catering cottages are 2 terraced converted 18th century stone stables. Each cottage has 2 bedrooms upstairs. There is a separate shower room with W/C and sink. Downstairs is open plan with fitted kitchen, living room and dining room. Your front door opens directly onto the courtyard where you can dine al fresco. Parking is off road to the rear of the cottages. Laundry facilities are available on-site. http://www.camping.ie for rates and further information. We hope that the sun will shine for you for your camping experience enjoyment, and that you will enjoy many happy meals al-fresco- but as this is Ireland, where it is dry apart from the rain, rest assured- we have you covered in any eventuality. 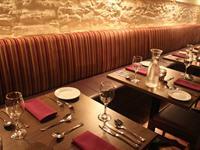 Why not make a reservation to enjoy a wonderful great value meal with family and friends. Please contact the restaurant directly on 062 56224 to reserve your place. Does a member of your group, love the idea of camping- but perhaps not enough to want to sleep in ‘The Great Outdoors?’- Why not make an enquiry about a stay in the Bed & Breakfast- For those who like their own bit of space and comfort- while remaining close enough to fully participate in all the joys of camping with the family on-site. Check availability on our site. We appreciate direct bookings.